I'm sure that headline just made every CPA reading this cringe, but really, with the help of software nowadays, it's simple enough to at least keep simple books for a small company as long as you're somewhat organized and hang onto receipts. Case in point: me. Like most people, I took an Accounting 101 class in school years back and retained none of it, so I was basically starting fresh. So armed with a limited knowledge of accounting, GNUCash, and the burning desire to not pay someone else to do our books, I set off to Youtube and a bunch of instructional websites. Here's a rather simplified look into that journey. Like a beginner learning to play the guitar or write code, you're going to make a lot of mistakes that can snowball into bad habits. Make it harder on yourself now than later and force yourself to do things the right way from the beginning. That means enforcing the double-entry method and being damn sure everything balances before moving onto the next transaction. This is painful. This is tedious. You will spend more time Googling than actually accounting. That's okay. Do it correctly now so you're not re-doing all your work later, after you understand what you're doing. Not sure what that is? Neither was I. And you know what? It takes a while to wrap your mind around it. Here's a link to a general overview. In a nutshell, the idea is to categorize revenue as unearned, or a liability, until you've actually fulfilled the order and earned it. So, for example, say you funded a Kickstarter and got $10,000 on December 1st. You don't want to report that as income or you're going to have to pay income tax on that chunk of cash before you got the chance to buy the stuff you need for your game. Remember, business expenses are tax deductible, so you want to log your expenses before paying tax. So using that example, say you brought in $10,000 in December, and the games + shipping are going to cost you $8,000 to fulfill. You'd count that $10k as an unearned liability and report no income for the year when tax season rolls around. As you purchase components for the games, you debit your expenses and credit your checking account, and when you finally ship your games, your liability is cancelled out with credits to your inventory and income accounts. This is the income to be reported in this new year. Reading the synopsis makes it sound logical and simple enough until you actually need to DO the accounting. Setting my accounts up to work with accrual accounting was, well, awful. I had no idea what I was doing, but It was a lot of trial-and-error and going back to change/fix mistakes in accounts that I assumed were completed. Don't import a CSV of all your bank transactions. You'll overwhelm yourself. 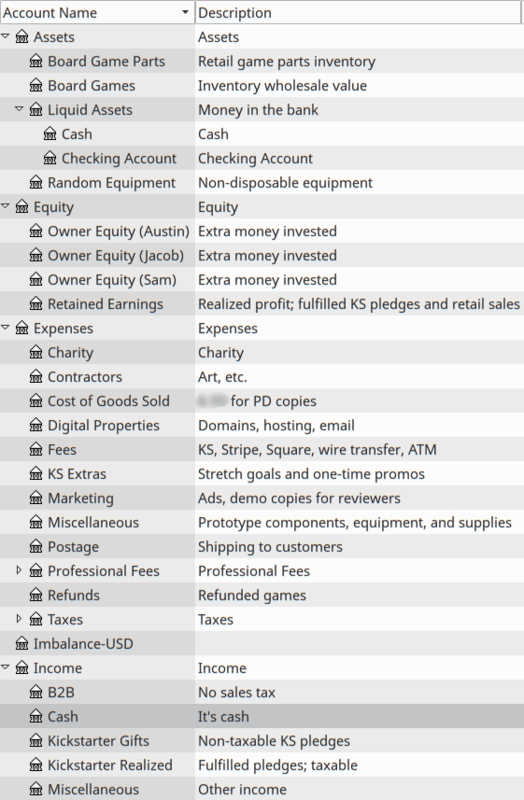 Do a few manually to determine what accounts you need and really make sure you're using double-entry. Again, enforce good habits now so you don't have to re-do all this later. You're going to run into weird stuff. The "gotchas" for me were understanding (and properly using) the "Cost of Goods Sold" account and correctly accounting for one-off fees (like Stripe or Square). Also, the Retained Earnings account is weird until you realize it's basically symbolic. My point is, you're learning something new and it's tough to get into the correct mindset. With our books, a single Square transaction hits 5 accounts. That didn't just occur to me while setting up the account structure... that was a lot of Googling, head-shaking, confusion, and trial-and-error until the accounts balanced and it made sense. Again, you're learning something new, so don't expect to sit down and understand it in ten minutes. The whole point of this post, though, is to say you can do it if you're willing to put in the time. I would have killed to see a board game company's books while trying to learn this stuff. The structure is really the most important part that pulls the whole method together, so I hope seeing this structure helps someone out there. You will almost certainly need to modify some things to fit your company, but this should be a decent starting point, or at least an overview that helps it all make sense. You'll see the debit column hits our "fees" expense account, our checking account, and the "cost of goods sold" expense account. The credit side is the gross revenue to the income account, as well as the "board games" asset account. That's our inventory account, and the cost of goods sold is the complicated (to my mind, anyway) way to subtract inventory while balancing your books. Again, enforce the double entry method. It makes transactions like this nonsensical at first, but I'm really glad I slowed down to understand the point of it when starting my books instead of needing to modify every transaction later when the books didn't balance. As with most articles on this blog, I don't claim to be an expert in this stuff. My books are probably not the most efficient or tax-effective way of doing things, but they get the job done, and I paid $0 to get them completed for taxes. Mystic Ape Games is a start up, and we try to bootstrap everything we can, from packing games ourselves, to learning accounting, to building our own website from scratch. A penny saved is a penny earned, and keeping at least rudimentary books for your board game company should be do-able for anyone willing to put in the work. Oh yea, don't do your own taxes. I mean, if you have a background in this sort of stuff, great, go for it. If you don't? Don't take the risk. Our federal return (that showed a loss... thanks accrual accounting method!) was 27 pages long. If you screw your books up, your CPA will catch it and have you fix it before filing your taxes. That's another reason it's sorta okay to learn the accounting as you go... you have a gatekeeper in the form of your tax consultant. He's going to charge you way more if he has to track down your raggedy receipts and build your books from the ground up than if you give him balanced books to work with, but he may still come back with some questions or problems with the books that should be easily solvable assuming you've had good practices from the start.